A stylish and funky three-bedroom apartment verging the city's central districts. Barony Street is a wonderful third-floor self-catering apartment in Edinburgh’s New Town, near the boundary with Leith and the Old Town. Barony Street is just off Broughton Street, which boasts numerous interesting small shops, delis for your morning coffee and excellent restaurants. The property is perfectly placed for experiencing the many facets of the city, including the high fashion and retail offerings of Multrees Walk and Princes Street, the Edinburgh Playhouse and pubs lining Leith Walk beyond, and of course the Old Town’s famous tourist attractions. The property benefits from cool, uplifting décor, complemented by zesty wallpaper designs in its main rooms. High ceilings and wooden flooring are feature and typical of Edinburgh New Town properties. As the apartment's three bedrooms are on the top floor they are insulated from the noise of the eponymous street they overlook. One of the bedrooms has a double bed while the master bedroom has a king size bed and a stylized rack of sloping shelves as an additional storage solution to its modern chests of drawers. A further single bedroom completes the sleeping setup. Ample seating for all the property’s occupants can be found opposite the wall-mounted flat screen TV in the sitting room, which also has a back projector for viewing on the wall itself. An iPod speaker dock with large speakers completes the entertainment setup. A smaller synchronized TV can be found around the corner in the adjoining kitchen, above the glass breakfast table seating two. The modern white kitchen also contains a washer-dryer, dishwasher and freezer in addition to the core amenities. There is also a small ‘Shiela Maid’ in the kitchen providing an alternative means of drying clothes for the environmentally conscious. Next to the double bedroom and across from the master bedroom is the modern tiled bathroom, with fixed and handheld shower heads, a retractable shower screen, and mirrored cabinets above the countertop faced with slate tiling. 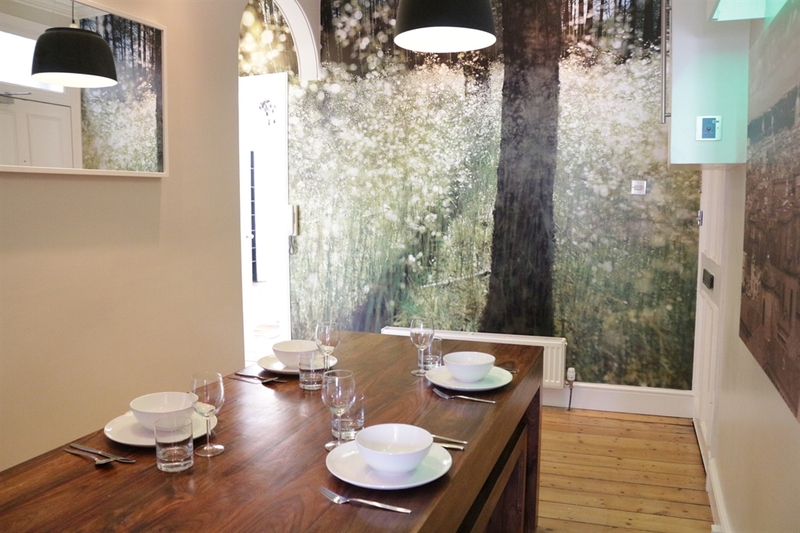 The real showpiece in this property is the hall/dining room with its stylish wooden table seating six and a stunning forest mural across the end wall, serving as a wonderful backdrop to meals and social occasions. The dandelions give a lovely diffused effect, contrasting with the stability and depth conveyed by the dark tree trunks. There is a small shared garden accessed via the basement of the property so you can enjoy the actual outdoors on clement days too. Barony Street is a clean, contemporary and at turns surprising apartment offering comfort, convenience and verve in equal measure. With these credentials it clearly qualifies as a great base for an enjoyable and memorable stay in its host city.